When Erdoğan was talking about having “Plans,” he wasn’t kidding. The plan for the last few weeks has clearly been drafted, redrafted, and drafted again. And Erdoğan has been executing it flawlessly. Israel is, all of a sudden, very alone as it faces the serious danger of a resentful (is that even the word?) Palestinian state springing up next door. But how long, exactly, has this been in the works? Despite claims that it had no role to play, there is little question that the Turkish government supported the flotilla, facilitating the IHH’s purchase of the Mavi Marmara ferryboat from the AKP-controlled Istanbul Municipal Government. But why, oh why, would the Turkish government support the fateful voyage of the Mavi Marmara? Could it be that they knew exactly what they were doing? Although the flotilla was certainly designed to prompt a confrontation that would embarrass Israel and weaken the embargo of Gaza, it seems unlikely that anybody had foreseen Israel’s clumsy attack on the flotilla, which left nine activists killed and dozens injured. Despite the high human costs, however, Turkey had the excuse it needed to finally end an awkward alliance with Israel, while its moral stature in the region was now unparalleled. Before the Mavi Marmara even set sail from Antalya in May, 2010, the “Plans” were drawn up. And what ended up happening on May 31 was probably even better than Erdoğan could have hoped, a real (as real as it could have been) reason to start dropping some diplomatic dead weight. With Turkey’s former strategic relationship with Israel no longer in line with its own nebulous East-leaning agenda, it was time to stop pretending that cooperating with Israel was a possibility. And as the vote for Palestinian statehood looms, we come to appreciate even more the well-orchestrated performance that Turkey has given us. Perfect timing—almost as if they… “Planned” it. Autographs after the show. 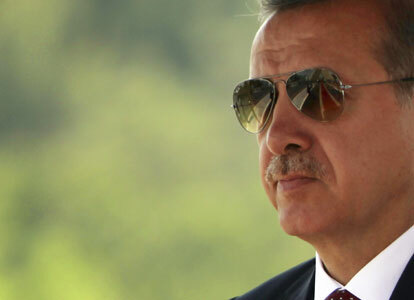 Rock on, Erdoğan.